"You've got to have some form of artificial propagation," he says, "if you want to have both dams and salmon." LEWISTON, Idaho -- Into the 1930s, the Nez Perce tribe's foothold in the Snake River basin teemed with nearly half a million fall chinook. By the 1980s, returns averaged 600 a year, thanks largely to hydropower dams that eliminated 85 percent of the king salmon's habitat. 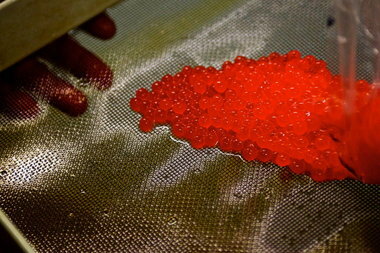 Salmon nests, or "redds," on the Snake and nearby Clearwater River were down to a handful. Cut to early November. Becky Johnson of Nez Perce Fisheries stands beside a lonely stretch of the Snake, watching through video goggles as a remote-control helicopter with a camera in tow buzzes above the river. Johnson's mouth drops open as the video rolls, "I can't even count them all." In recent years, the Nez Perce and state fish and game offices have deliberately stocked spawning grounds on the Snake, Clearwater and Grand Ronde rivers with young hatchery fish to bolster anemic returns of wild fish. The Nez Perce also jacked up production, building a new hatchery for spring and fall chinook. That hatchery "supplementation" strategy -- releasing much-maligned hatchery fish on the spawning grounds -- is highly controversial. Scientists and wild salmon advocates worry hatchery fish will weaken the gene pool of wild fish in the long run. Nez Perce Hatchery Strategy Pays Big Dividends for Snake River Fall Chinook, Raises Big Questions for NW <-- Full Story, Videos and Photos at original site.